US President Donald Trump signs a presidential memorandum imposing tariffs and investment restrictions on China in the Diplomatic Reception Room of the White House, March 22, 2018, in Washington. 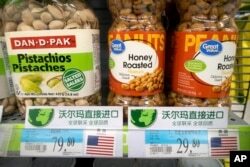 China responded swiftly to President Donald Trump's announced plans to levy tariffs on up to $60 billion on Chinese goods, warning the proposed move risks pushing trade relations into the danger zone. In a statement early Friday, just hours after President Trump signed a memo paving the way for major tariffs on nearly 1,300 Chinese imports, China's Commerce Ministry called on Washington to carefully consider its next policy steps, urging it to "pull back from the brink." The ministry also announced in a separate statement on Friday it was mulling retaliatory measures to steel and aluminum tariffs announced by the Trump administration earlier this month. In the statement, the ministry said if necessary it would target 128 different U.S. imports. The measures include a possible 15 percent tariff on goods such as fruits, nuts, wine and steel pipes and a 25 percent levy on pork and aluminum imports. China has said the actions, which amount to some $3 billion in trade, will be put into place if a trade remedy agreement cannot be reached between China and the United States. Beijing also said it will take action at the World Trade Organization in response to Trump's trade actions to protect its rights. China has said if it has to fight a trade war, it will fight to the end. Despite the tough talk, Beijing has come up with little in the way of retaliatory action. Its $3 billion plan in targeted U.S. goods is still a tiny fraction of Washington's $60 billion trade restriction plan. For now, Beijing seems to be avoiding a head-on collision in the trade arena and focusing on optics. Raymond Yeung, a senior economist for Greater China at the Australia and New Zealand Banking Group (ANZ Banking Group), said he was not surprised by Beijing's response to the announcement. But, clearly the Trump administration's approach has hit a nerve for China, he added. "I don't think the figures matter, I think the focus should be more on the worsening of the relationship of the two biggest nations in the world, which is much more important," Yeung said. 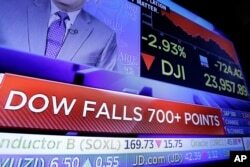 On Friday, markets were clearly concerned about the broader impact the growing dispute could have as the announcement shook stock indexes across the region. China has taken note of the strong backlash in response to the steel and aluminum tariffs announced earlier this month and suggested it could work together with other nations at the World Trade Organization who are also in opposition. Late Thursday, after the announced China trade actions, the White House announced temporary exemptions for the steel and aluminum tariffs for a number of countries including Canada, Mexico, South Korea Australia and the European Union. And the United States is not the only country concerned with China's practices of forced technology transfers in joint ventures, subsidies for state-owned companies, and intellectual property theft. Alex Capri, an international trade scholar at the National University of Singapore, said what is happening now, especially over the past few months, is unique. He said China is really feeling the pressure from its trading partners. "This is the first time where I think China is having to reconsider what I would call its systemic trade apparatus, in other words it's economic nationalist policies that are very, very supportive of its own industries through various protectionist mechanisms," Capri said. Chinese Premier Li Keqiang speaks during a press conference after the closing session of China's National People's Congress (NPC) at the Great Hall of the People in Beijing, March 20, 2018. 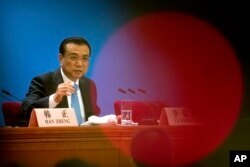 China denies the accusations of unfair trade practices and has pledged to continue to open up its markets. Earlier this week, just two days before Trump's announcement, Chinese Premier Li Keqiang said there will be no forced technology transfers and pledged to better protect intellectual property. A day before Li spoke with the press, the country's newly appointed governor of the Central Bank of China, Yi Gang, promised a number of reforms to open up the financial sector were coming over the next few weeks. Trump's actions still leave some leeway for a deal to be worked out before the measures are put into place, much like with the steel and aluminum tariffs. A proposed list of tariffs will be submitted to the president in 15 days. And then, after a final list of goods is published, there will be another 30 days left for consultations — a window perhaps for Washington and Beijing to work out some kind of compromise. "I think that provides for leeway and it's a tremendous bargaining tool and I think the Trump administration is going to use it as a bargaining tool and they are clearly using Section 301 to get China to come to the table and start thinking about concessions," Capri said. Capri added, however, that regardless, he believes the punitive measures will still come, but the big question is how much? A Commerce Ministry spokesman said China is still keeping in touch with the United States and communications are smooth. ANZ Banking Group's Yeung said he was doubtful the Trump administration wants to talk. "The problem is now what does the U.S. really want? Does it want to talk to China? Or does it want to insist and go forward with this plan." Yeung said since the outcome is still unclear, the dispute could become an opportunity, but don't expect Beijing to have a soft response. He added that China is in a much different place today than it was when economic sanctions were slapped on it in the wake of the Tiananmen Square crackdown or 10 years ago before the financial crisis. He believes the Chinese economy is big and powerful enough to absorb the shock brought on by such measures, which would only be a small fraction of China's overall economy.